Best tampons to buy: Tampons saving women from Bleed for You. Vanessa and Cherry created tampons to save the world. EXCITING UPDATE: In honour of International Women’s Day, Bleed For You are going to pay your tampon tax for you this month. 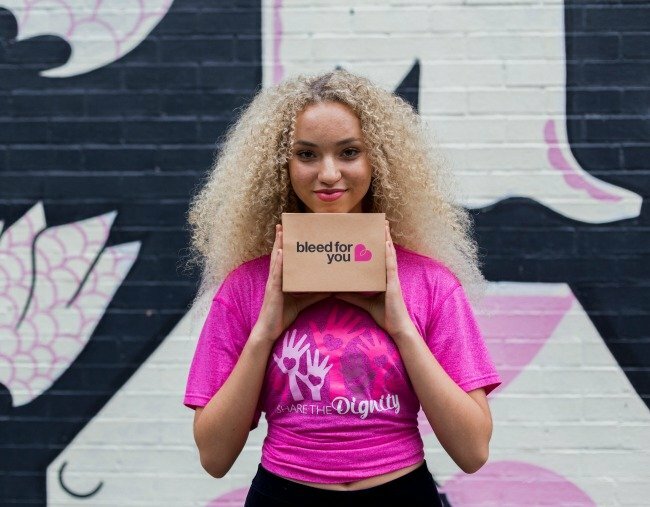 Bleed For You will pay the tampon tax for every box of organic tampons bough through their website in March. It’s time for the tax to end. Period. Also, how amazing is this video about how seriously un-luxurious tampons are below? Post continues after video. Vanessa Alexander and co-founder Cherry Connew believe in the power of socially-conscious and environmentally sustainable enterprises to create change. With their company, Bleed for You, they are committed to supporting access to women’s reproductive health services in every way they can. They got talking over a glass of wine one night about where the profits from tampons went. They discovered that the profits most definitely do not go back to women. Instead, they go to big overseas ‘multi-corp octopuses’ with male CEOs who prioritise profit for shareholders and don’t care about women or the environment. It shocked them to discover that pads and tampons are a ‘blood’ market worth around $35.4 billion worldwide. So, they set out to create an option for women that gave some of the profits back to women in need. Across an average woman’s lifetime, she’ll purchase around 14,000 tampons, so wouldn’t it be amazing if we used that buying power for good? Read Vanessa’s interview with Mamamia. What is Bleed for You? A small, Australasian tampon company with a big heart. We deliver to your door ethically-certified, organic cotton tampons and give 50 per cent of profits to charities that support women’s health and education. Vanessa Alexander (left) and Cherry Connew (right). Image: supplied. I&apos;ve always been a freelancer, but usually in writing and directing. I wrote on Love Child, The Wrong Girl and The Secret Daughter, and I directed TV for nearly a decade. In fact, I&apos;m pretty sure I was the first woman to direct Power Rangers for Disney. I walked in the #WomensMarch with my daughter and I thought, this has to be the biggest collective action ever in the history of the planet. And it was organised by and for women. There seems to be something in the air at the moment. A desire for change. A fight back. A drive for equality that I&apos;m really excited about. I think the internet has really opened up the marketplace for new brands by allowing a more direct conversation between the consumer and the brand. Women think a lot about the world and the people around them, but it&apos;s often hard to be socially conscious unless it&apos;s made easy for you. Online shopping has facilitated the rise of women creating and selling products that support their needs. Before, you went to the supermarket and only had a few choices. Today, you can get products that support your needs and social causes (organic, ethically-made, sustainable) delivered directly to your door. Bleed for You isn&apos;t trying to keep your period a discreet little secret. We are saying, yes, women bleed. And if you&apos;re going to bleed, you may as well bleed for you (or the sisterhood) by giving profits back to women. We raised $10,000 in pre-sales and funded the rest ourselves. The pre-sale was useful as a test market as well. I attended a small business course. That&apos;s it. In retrospect, I could have done more but once I decided I was doing it my focus was on the business. "Never get into a fight you can&apos;t enjoy," my Dad always told me. I am motivated to fight back against the crap women are dealing with in the world. Look hard at every area of your business and make sure you or the team has the skills and time to deliver on it fully. If not, you need to pay for it. At Mamamia, we have an expression &apos;flearning&apos; - failing and learning. What have been your biggest flearnings since you started your business? The biggest mistake I&apos;ve made was underestimating the time it takes to generate content needed for social media and marketing. In a content driven world, it&apos;s hard to stand out and keep standing out. Getting people to know about your product is the most important thing, as it drives the sales. What is the smartest thing you&apos;ve done since starting your business? The smartest thing I&apos;ve done is reach out to other women for help. Women are incredible connectors, have a wide range of skills and are great at multi-tasking and getting things done. We have gotten this far because women were prepared to give up their time to get a product like this out there. You can also partner with other great women. We met Rochelle Courtenay of Share the Dignity a year ago, and we have helped each other in many ways. I&apos;m so grateful for her input and delighted to be sharing our profits with her charity. Shopify, Canva, Facebook, Shopify, Xero, More Shopify, Photoshop, Google Drive. Actually, we couldn&apos;t do this without technology. Cry and then make a list. If I get it out of my brain I can sleep better. Oh, and I&apos;m notorious for sending long emails. I work way too much. It would be great if Bleed for You actually took over my whole life and I wasn&apos;t juggling multiple work strands anymore. This and six kids is enough! That is was hard. I didn&apos;t start one earlier because of this misconception. I thought, I&apos;m a writer, what skills do I have to run a business? I couldn&apos;t have done any of this without other people. By putting together the right people, with the right skills, and the right common objectives, I was able to get things done. Getting our first box design on Women&apos;s Day 2016 and posting it to social media for the pre-sale and knowing that from that point there was no way out. I have six kids. Five are biologically mine. They are 24, 20, 20, 12, 8 and 3! Three girls and three boys. My life is crazy. I have also still been working as a writer for TV shows. Not enough. But I do try to get seven hours. If not, I start to cry about random events. Sleep is so important but when I am stressed I definitely have trouble doing it. What can you recommend to women to get their own hustle going? Do it. There is only now. No one is going to solve the world&apos;s problems but us. Since we&apos;re in the #LadyStartUp spirit, what Lady Start Ups do you recommend? Fresh Marketing is a Newcastle-based marketing company that works nationally and internationally - including supporting projects trying to save the rhinos in Africa. For me, this kind of business represents the future. Bleed for You is offering $10 off first delivery for subscribers only (you can cancel any time). Use the code LADYSTARTUP.